Planning your big day can be so much fun, working out all of those little extras that make the day unique to you. 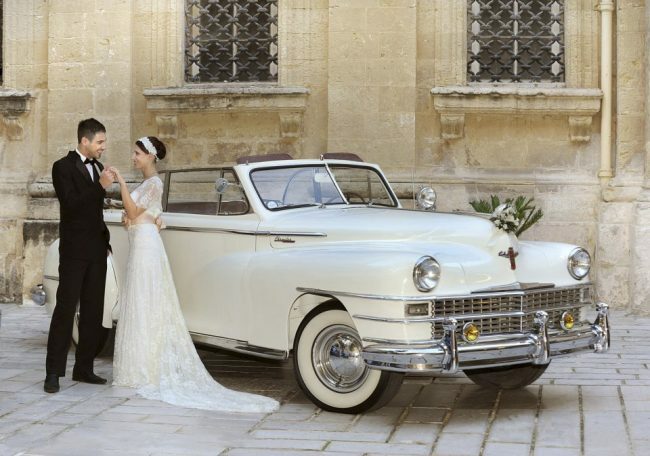 Choosing your wedding car isn’t just about getting from the church to the venue or from your home to the ceremony. It’s about setting the tone of your wedding, adding that bit of luxury and showing your personality throughout your big day. Plus get a great photographer and they will look amazing in your photographs as well. 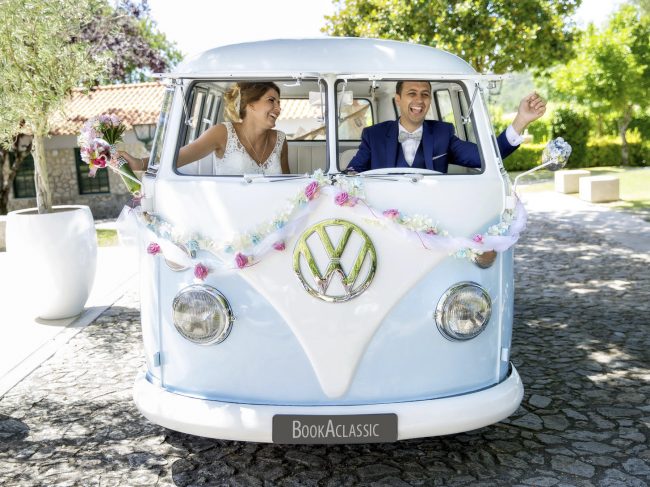 It’s very popular at the moment to have VW camper vans as transport for the bride and her bridesmaids. A couple of my friends have had these in the last couple of years and their photographs look fabulous. When I got married we didn’t have any transport, I stayed at the venue the night before and my Hubby arrived in our car. I do however wish we had images of us with stunning cars. 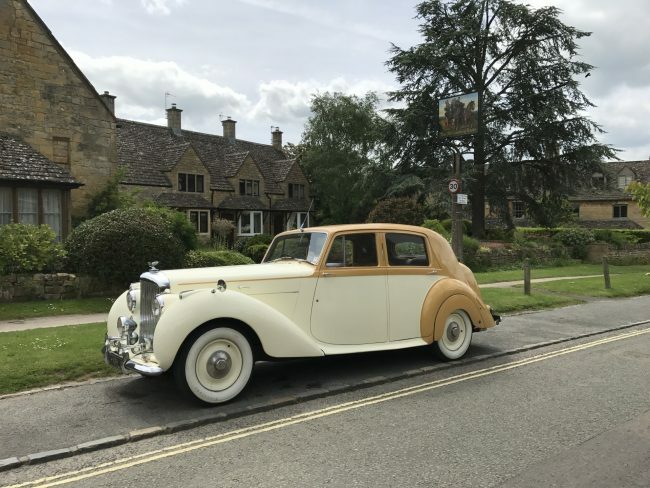 There are so many different Classic cars around for hire and Book A Classic is the perfect place to start looking for the perfect one for your big day. Using Book A Classic is a one stop shop, it has a hundreds of cars listed and you are easily able to search the cars within your area. I have picked out my top 5 Book A Classic cars to have at a wedding. The VW camper van, like I said before they make for the amazing photo graphs, plus how much fun for the bride and her bridesmaids to travel all together in the same vehicle. Also for those having a few bridesmaids by having a VW camper van will save hiring more than one car for the day. The Chrysler Windsor convertible, such a classic car and so beautiful in a the ivory colour. Looks great in your photographs and will make a fabulous impression on your wedding guests. If you are looking for a cute little classic but with a splash of colour, what about this lovely VW Beetle Fusca. It’s the perfect little car for a rustic wedding. I can imagine with the burnt orange colour of the car, with the autumnal shades of flowers….. beautiful. For the more traditional style wedding transport what about a Bentley Mark VI. It oozes country manor grandeur, beautiful in images and a classic car like no other. I love this. 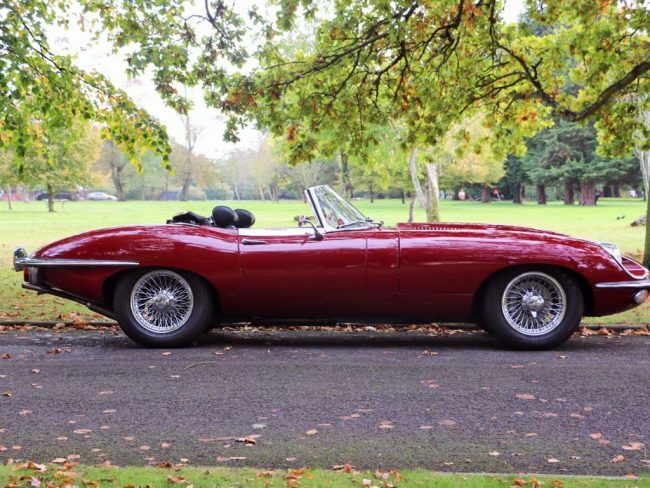 The E type Jaguar is the car of most men’s dreams. The E Type is very popular with Grooms men, they hire the car to drive. Arrive with the best man, then use it to drive their new wife or husband to the reception venue. Just like the Royals do. These are my top picks from Book A Classic, what do you think? 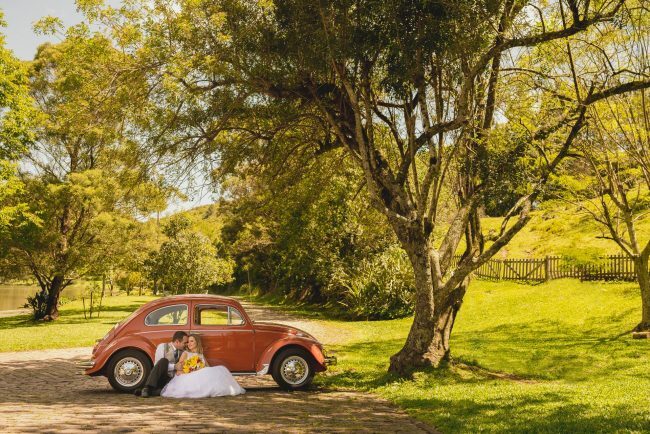 What would be your dream transport for your wedding day? For me I would love the Bentley and my Hubby would go with the E type. Planning a wedding should always start with choosing the theme and colour combinations that work the best for you and your partner. You need to make the day be about you. 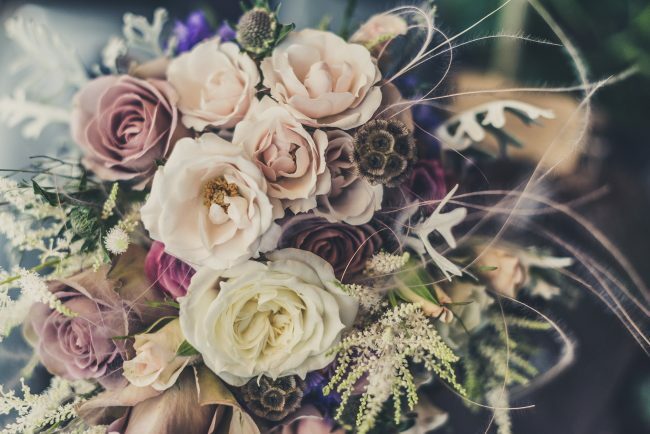 Don’t let your wedding planner influence your choices, and make sure that you choose the colours that represent your personality and matches your style. Below you will find a few tips on choosing the colour themes for a perfect personalised wedding. White with gold, pink, or silver might seem like the straightforward choice, but you need to dare to be unique. If you love purple and yellow, and would like to create a fun atmosphere, nobody should hold you back. Choose the flowers according to your colour theme, and dress your tables, venue in the shades you prefer at home. Make sure that you have a neutral background colour, such as beige or white, so your unique decorations are getting noticed. 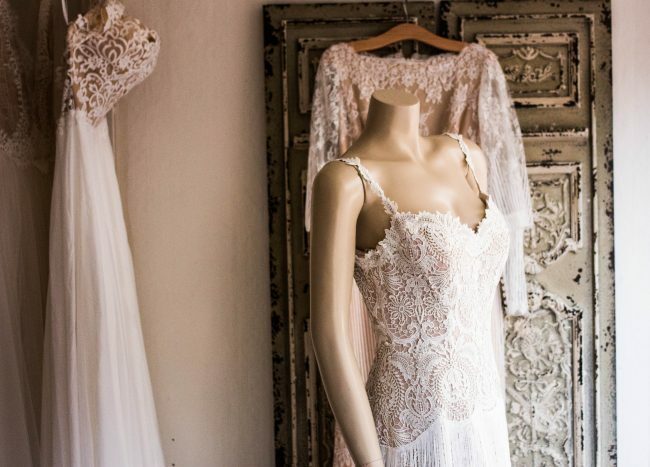 White dresses are a part of wedding traditions, but you don’t have to completely stick to the rules. You can choose a different colour tiara or shoe, and make a statement. A flower in a dark red will make you stand out more, especially if your future husband wears similar colours. You can search for mens wedding suits in different colours, and choose the appropriate flower decorations, so your looks are a perfect match. Make sure that your bridesmaids’ dresses create a perfect contrast with your dress. Create a contrast with your accessories. Your flowers need to be colourful, to get noticed in the white background. Get a necklace that is bold and beautiful, and a bracelet made of colourful floral motifs. Choose earrings that are not overwhelmingly large, but contain your wedding theme colour and suit your skin tone. 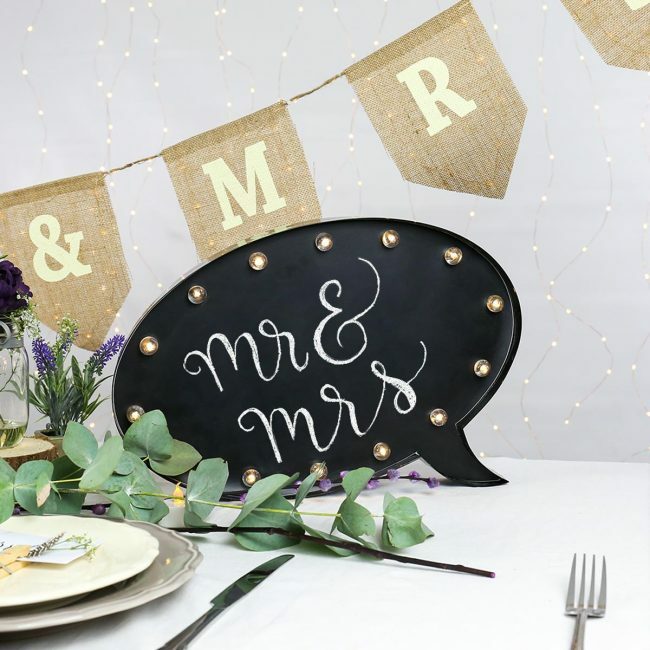 Choose matching tablecloths, serviette, and napkin rings,cutlery, and chair decorations. Everything at your wedding should be about you. Get creative and order a cake that is modern, bold, or even funny. Choose a colour for the decoration that is present in your venue, and motifs that are similar to your floral bouquet. If you are going for a pink princess theme, you can get a palace-shaped wedding cake made. Love red? Get some strawberries and raspberries scattered around the cake for contrast. Add colourful edible flowers or marzipan to compliment the main colour. Avoid bland and boring food, if you want your wedding to represent your personality and attitude toward life. You can use food colouring, or even edible flowers to decorate the plates with the same colours and match the style of the wedding venue. Choose your tableware according to your menu and original colour theme. Choosing the right colours for your wedding theme helps you make your big day memorable and unique. Get planning and find the shades that suit you the most. Talk to your bridesmaids before you decide, but avoid the standard boring combinations. Get creative, and make sure you add a unique colour you and your future husband both love and suit. Well it maybe cold outside but that does not stop wedding planning. Did you know that during January and February there are more wedding plans made than any other months of the year? That because 33% of engagements happen over the Christmas period, according to Festive Lights who ran a survey of 1,009 people in the UK. So couples are excited to get planning. Last Christmas my brother-in-law finally got down on one knee after 9 years together, and proposed. It’s really exciting to have a wedding to look forward to. My Hubby is one of 7 children and so far only him and his elder step-sister are married, so as a family there could be another 5 more weddings to look forward to. The first one later this year and then another one next year. Then we will be 4 down 3 to go… fingers crossed as I love Weddings. The couple that got engaged at Christmas are getting married in 2019. They have decided to have a strong christmasy theme. It’s their favourite time of year, snow, lights, warm cosy fires, presents, Christmas trees, Christmas decorations, blankets, mince pies, crackers and mulled wine, plus it’s when they got engaged and they first met during December. So December is a special time of year for them. They have both spoken with me about the ideas for their wedding and one thing that really stood out was lighting. As they are planning on a December wedding, it’s going to start getting dark late afternoon, so having those extra lights will add that magical feel to their wedding. When you first start to think about your wedding, you really need to think about your budget and stick to it. It’s very easy to start wanting lots of extras, but they all add up and your budget will soon be gone. Go and view venues, I would highly recommend viewing a few different ones to see what they all have to offer as each venue has something different. When you have found the one, you can get the it booked by putting down a deposit so you have a date, which means you can send out save the date cards to family and friends. It also means that you are able to confirm photographers, bands, caters, cars…….. the list is endless. Each wedding normally has a theme and colour scheme, it could be a vintage feel, hollywood glamour, a colour theme or even a disney theme. 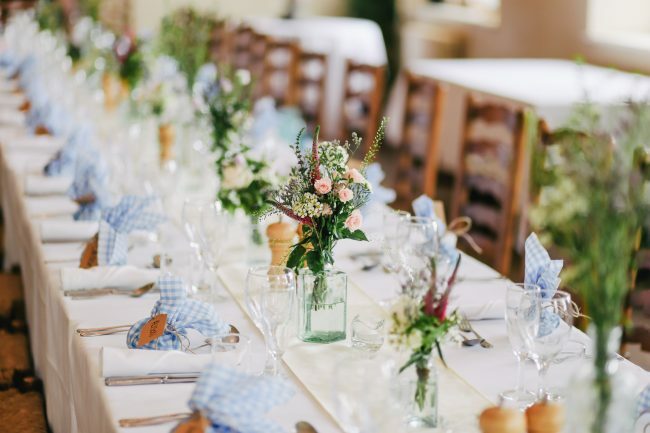 Whatever you decide for your theme and colours it will allow you to start planning and buying all of those little extra that help to complete the wedding. For my brother-in-law and his soon to be bride, we have spoken about adding lighting to the tables. They are planning for hundreds of twinkling lights around the venue, in the trees on the drive up to the hotel, not forgetting in the extra Christmas trees they are going to be bringing in for the day. I feel that adding twinkle lights or fairy lights to your table centres, adds that romantic atmosphere to the feel of your wedding. For a winter wedding it also brings it from day to night easily and will look amazing in the photographs. 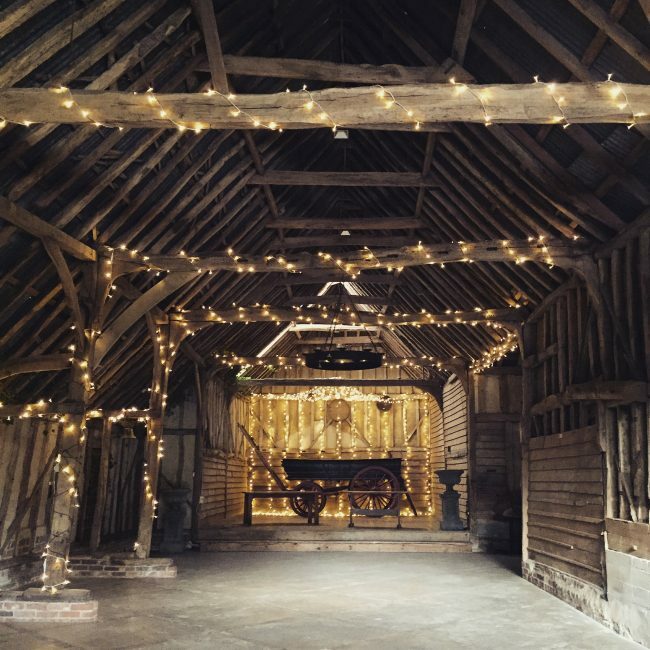 Having lights as part of your wedding can really transform your venue into something quite spectacular, it can give your wedding that wow factor without being over the top and extravagant and doesn’t have to be budget blowing either. When I think about winter weddings, I think candles, lots and lots of candles. I then think children’s fingers and wax getting onto the brides dress. 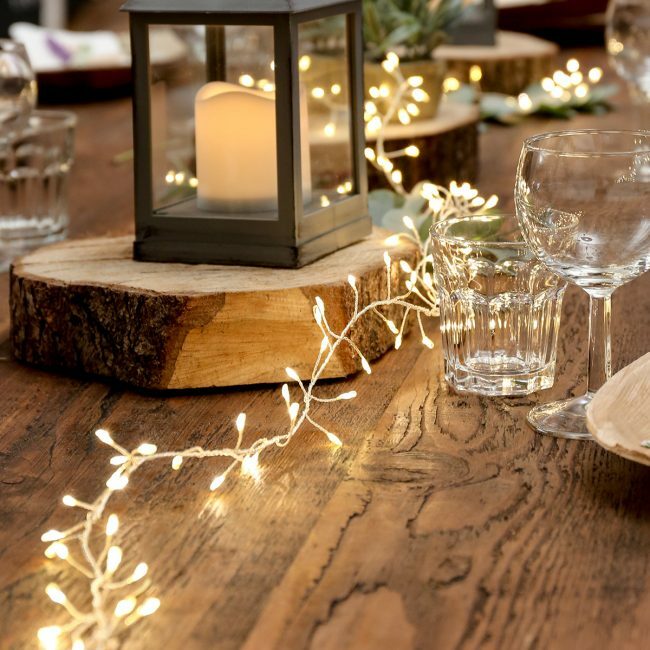 But by having a few well placed candles and then beautiful lighting it will bring that cosy warm winter feeling to your wedding, without the worries that go along with candles. Plus some venues might not be happy having lots of candles. What are your thoughts about having lighting at your wedding? Bride Magazine have a lots of great ideas for wedding lighting, pop over to have a look.